The Sea Unicorn, our spacious family home of up to 1800 sq ft, offers a first floor accommodation with limited access to a lovely balcony with full views of the ocean. The home sits at the end of Ocean Boulevard on a half acre lot about 150 feet from the ocean on the west side of a cul-de-sac. Our Ocean Boulevard is only about a dozen or so lots long, cut off on the north end by the Myrtle Beach State Park, and on the south end by the Lake that comes from the park and flows in our back yard. The far south end of the lake flows into the ocean so the tidal brackish water, a mix of salt and fresh, supports a myriad of diverse life. You have to see this natural wonder to believe it. The 3 bedrm is eighteen-hundred square feet of Non-Smoking rental space on the lower level includes 1 king, two queens. There's also a living/dining area about sixteen by thirty-five feet with a 55" TV, a twelve foot by twenty-six foot fireplace room w/ a 40" TV. There are 2 full bathrooms, a shower room and a 1/2 bath, a completely equipped Euro Cab kitchen and a separate laundry room with beach toys and chairs . Wireless Internet access is provided. The 2 east bedroom's, each with a glass block wall, and each with sliding glass doors, open up to the patio that faces the beach, and the fireplace room glass doors open to your private pool patio and the Lake in your huge back yard. 2 of the 3 bedrooms have sliding glass door for outside access the third, a single glass door. The private 46 foot X 16 ft salt water pool features 4 pairs of built in seats, 2 with jets, and a kidney shaped spillover, a separate hot tub for relaxation in our beautiful back yard with fruit trees, Crepe Myrtles, and more. The 140 ft deep lawn stretches to our lake, and a rope swing hanging from the large oak tree that shades a picnic table Other extras include 2 row boats, paddle boat, grill, porch swings, kiddie slide, and a basketball net. It is like a little private park. Smaller parties of 4 or less may rent 2 bedrooms for less, which includes amenities mentioned, excluding king room. 1 or 2 people may choose to save even more buy renting a 1 room efficiency that does not include anything but the one room, king bed; coffee maker, ,toaster oven, no pool or yard access but directly across from ocean , and with separate and private entrance. Prices displayed only show 3 bedroom. Please write to owner for adjusted price for less guests and less beds or amenities. You may bring your own linens, or we can provide you with linen service $175.00 for 3 bedroom (6 people). Extra linens per person is $9 for set of 3 towels . Check out cleaning service is $150.00 for 3 bedroom. Long Bay Estates enjoys one of the widest beaches on the strand since we have no high rises for a couple of miles in either direction, and the State Park stretches for about one and a half miles along the coast. A walk up the beach takes you to the State Park Pier for fishing or ice cream, or walk a little further to Springmaid Pier for breakfast or lunch. If you prefer to walk only a few feet for fishing, you can surf fish on the beach or simply just walk in your own back yard to the Lake and fish for fresh and salt water critters from the bank or from our private boats. The Sea Unicorn is truly a unique family vacation of fun and privacy, yet still in the heart of the town, close to the excitement, There is no worry about who to call if there's a problem, since the owner lives upstairs on the north side of the property in separate unit. Call soon, we book quickly. The Sea Unicorn has been our family home since 1978. It was a simple wooden beach house with an unfinished downstairs. Little by little, my parents added the porches, the fireplaces, laundry room, brick, greenhouse, garage, patios, flowers, trees. Hurricane Hugo tried to take it but the family home stood firm, even the greenhouse, well the frame anyway. Dad built it with 4x4's, notched, and huge 6' bolts, and poured concrete. Mom said, 'whats your father building now?'. 'A green house for you.' 'What with all those 4x4s and those huge bolts?' ''He said he wanted to make sure it was still here if a Hurricane blew through'. And so it did. The house lost the downstairs, most of the roof, and we had to gut the rest, but we built back with the same love and devotion, with updates, but in keeping with the character and nostalgia of our family memories. Our green row boat is the very boat my Dad purchased when he arrived and used himself for fishing. It ended up on the other side of the lake in Hurricane Hugo, but we found it and brought it home, and there it remains, in Daddy's spot by the Lake. We invite you to share the quiet, peaceful pleasure of our lake with its wildlife on one side, the sound and the feel of the ocean on the other, and a few minutes walk up one of the widest beaches in Myrtle, the State Park. We are sure you will enjoy our family home as much as we do. We love our quiet, relaxing neighborhood. We feel we have everything; the ocean is to the front and the lake is on the back, the State park is at the end of the road. Its our little piece of paradise, hidden from the mainstream, yet still centrally located to everything, restaurants, amusements, golf. For years Long Bay was called Myrtle Beach's best kept secret. This exclusive little neighborhood is small and secluded, hard to see from the main road, hidden in the trees , by the sea, and on a lake. Its peaceful, relaxing, remote feeling, yet close to everything. And the half acre lot is large enough for games, sports, fun. It is your own little park. Plenty of herbs and spices, etc. We had a great stay in Myrtle Beach. The house was as advertised with just about anything you can think of and more. Jin was extremely friendly and very responsive. I am sure that if there had been any issues they would have been taken care of quickly, as it was, she seemed to have thought about everything we would need for our stay beforehand. The location was awesome, close enough to downtown Myrtle Beach that you have access to everything, but located in a private development with enough privacy to enjoy the quiet and relax. The back yard and private pool were icing on the cake, after a nice day at the beach we were able to relax and cool off in the pool. I would recommend this property to anyone who wants a nice, quiet, relaxing, and enjoyable stay in Myrtle Beach. Thanks Jin!! Jin is great. No problems at all, house is exactly as what is described. Would love to come back. Everything you’d expect for a beach house get away! The place was absolutely perfect, Jin is a wonderful person to rent from couldn’t have asked for a better experience. 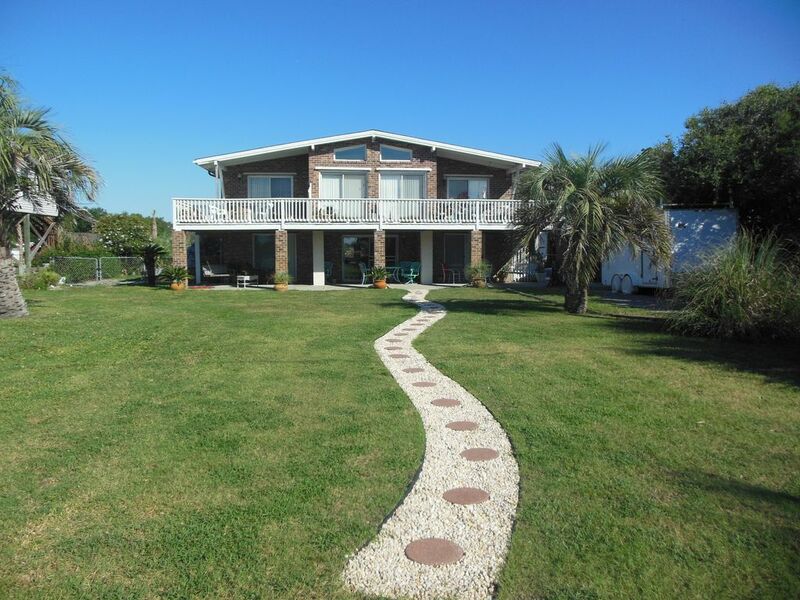 Highly recommended this beach house for your next vacation, from the location to the beach, to the the perfect location between the boardwalk and murals inlet, and the in ground pool and hot tub was everything we were looking for in our vacation. Look forward to visiting again! Great little old beach house! It was a wonderful stay at the property. Definitely a great place for a family to come and enjoy the beach. There are a few quirks but just speak to Jin and she's very helpful. Looking forward to coming back here next year! Charming and clean throw back beach home! We VERY much enjoyed our stay. Jin worked with us to reschedule after my mother in law passed away right before our original trip. I was drawn to this home because of the unique location and the price. This is an older home but it is roomy and clean and VERY charming. You are literally across the street from the beach and you can safely and easily walk 100 yards to the access point and be in the sand...no traffic worries and no crowds at all. The reed pond in the backyard the pool/hot tub it’s an amazing set up! So peaceful!! The weather wasn’t great for our stay a big part of the time but it was just so nice and relaxing to hang out and listen to the roar of the waves. Most people will not allow you to bring more than 2 dogs but Jin allowed us to bring a 3rd we recently adopted since all 3 were small. Jin lives above the rental and made herself available if we needed anything. We rarely ever heard her upstairs at all which is a huge bonus compared to staying at condos or hotels. If you are looking for the Taj Mahal (did I sell that right haha!) you’re looking in the wrong place. It’s and old home with a great history of you get a chance to chat with Jin. It’s a true beach house with a ton of character, a ton of outlets that are easy to reach, and the most amazing location and amenities combined we’ve experienced at a beach rental. There is not central heat and air but with all the window units and the way the home is built I can’t imagine it being uncomfortable in the summer. It got down to 38 one night and we barely needed the heaters provided. My only complaint was the WiFi was a little spotty and weak so using a roku wouldn’t really work. It didn’t hamper our stay and it was wayyyyyy better than the WiFi at any hotels we’ve stayed in at myrtle. We are typically edisto beach peep especially in season but we will absolutely be back either out of season or close to summer hopefully with some of our kids/grandkids...this place would be so much fun for a family! Market Commons is bicycle riding or golf cart distance and is home to a lovely lake for walking around, a park for kids with a "Music Garden", restaurants, bars dining, shopping, movies, exercise, ball fields, , all in the Low Country style of Charleston. About 2 miles up the Hwy 17 is Radical Ropes. Broadway at the Beach is about 5 miles. The Myrtle Beach State Park is a walk up the beach where nothing but nature touches the sea, and our neighborhood. We are close to so much , yet hidden from chaos and traffic, nessled quietly among the trees, on the lake, by the ocean. We are our own little park.